Doris L. Mannen, 94, of Topeka, passed away on Monday, November 19, 2018. She was born on March 22, 1924 in Centralia, KS the daughter of Lester and Axie (McDougal) Smith. She married Roy Edward Mannen on December 30, 1972 in Topeka. He survives. Other survivors include son, Richard Johnson of Silver Lake, KS; step-children, Diana Busey and Roy E. Mannen; as well as two grandchildren and two great-grandchildren. She was preceded in death by a son, James Johnson; and siblings, Maxine Feldhausen and Emmett Smith. She worked in a one room school house for two years in Mayetta, KS. Doris worked as a Human Resource Specialist for the State of Kansas for 25 years, retiring on March 17, 1988. The family will receive friends during a visitation from 5:00 to 6:00 p.m. on Friday, November 23, 2018 at Penwell-Gabel Mid-Town Chapel, 1321 SW 10th Avenue, Topeka. A funeral service will be held at 11:00 a.m. on Monday, November 26, 2018 in the chapel at Mount Hope Cemetery, 4700 SW 17th Street, Topeka. Burial will follow in Mount Hope Cemetery. The family will host a reception immediately following the graveside services. Memorial contributions may be made to the Topeka Alzheimer’s Association, 3625 SW 29th St., Suite 102, Topeka, KS 66614 or Great Lakes Caring Hospice, 3715 SW 29th, Suite 100, Topeka, KS 66614. Add your memories to the guest book of Doris Mannen. I remember Aunt Doris as being a beautifully kind person. Keep the memories of her close and she will be with you forever. We have so many wonderful memories of Doris. We lived across the street for many years. Doris was a wonderful Friend and neighbor. I am sorry to hear of Doris's passing. My prayers and thoughts are with the family. I am Lillian Roy's daughter-in-law . Doris next door neighbor for many years. Our Deepest Sympathy to you and all your family in the loss of sweet Doris. 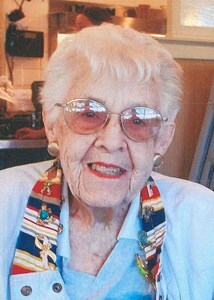 She will be sadly missed by all of those that knew her at Denny's on the Blvd. We have so enjoyed getting to know you and visiting with you the past few years in the evening at Denny's. Our thoughts and prayers are with you all. Know Doris was well loved, and we pray for peace and comfort and that the Lord will wrap His loving arms around you in the days ahead. My sincerest condolences to the family. May the God of all comfort grant you strength and peace during this most difficult time. (2 Corinthians 1:3, 4) And may your hearts soon be filled with wonderful memories of joyful times together as you celebrate a life well-lived. Many wonderful memories. Especially camping in Texas, Milford and melvern. Hugs and prayers for Roy and family.